Well designed type does far more than convey information; it's a work of art. 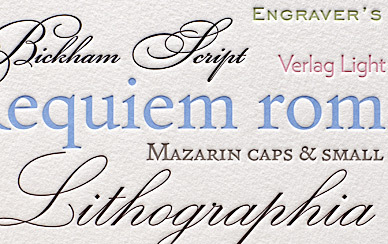 Of the three dozen typefaces and styles we offer, most of our favorites were designed by Hoefler & Frere-Jones (www.typography.com), the 2009 finalist for the National Design Award in Communication Arts and recipient of many other awards. Three H&FJ fonts are shown above: Requiem and Mazarin, distinctive and elegant typefaces with origins in the Renaissance; and Verlag, a sophisticated sans serif originally created for the Guggenheim Museum. You may also use hand-drawn calligraphy for your wedding invitation. Like type, calligraphy can be ornate or plainspoken, formal or casual, elegant or playful, but it will always have a more varied texture than words set in type. You can combine type with hand lettering by using calligraphy for the bride's and groom's names on an invitation, with the rest of the text set in type. Although nothing is more beautiful or more elegant than exquisite type or calligraphy, meticulously printed on 100% cotton paper, beautiful and elegant invitations can also be created using other design elements. Visit our Gallery to see some of the dozens of invitation designs we offer in our two invitation albums: Letterpress Wedding and Special Edition Wedding. We're also happy to work with you to create a custom design. For this you can choose from our collection of art, or you can send us scan ready art or a digital file, provided it is your original creation, copyright-free, or you have obtained permission to use it.